Habitat for Humanity East Bay/Silicon Valley's mission is to put faith in to action by bringing people together to build homes, communities and hope. Habitat for Humanity East Bay/Silicon Valley revitalizes neighborhoods, builds affordable and sustainable housing solutions, and empowers families through successful homeownership. Since 1986, we have partnered with volunteers, the community, and qualified families with limited incomes to strengthen communities in Alameda, Contra Costa, and Santa Clara Counties. Habitat for Humanity East Bay/Silicon Valley accepts donations. Donate Now. 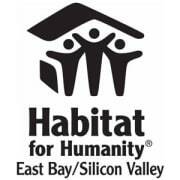 Would you recommend Habitat for Humanity East Bay/Silicon Valley? It was a lot of fun volunteering at the Restore! Habitat for Humanity is a great place to volunteer. I have been working with them for the past month helping to convert paper documents to electronic documents. They are flexible and work with my schedule. The office environment is casual and pleasant.